When it comes to hardwood floor restoration services, Sunshine Hardwood Flooring offers the best value in Boise, Idaho. We are a family-owned company, and our owner has four decades of wood flooring and stair refinishing experience. With a team that is highly experienced, knowledgeable, and friendly, we have served thousands of satisfied customers over the years. In fact, over half of our business comes from referrals and repeat clients. 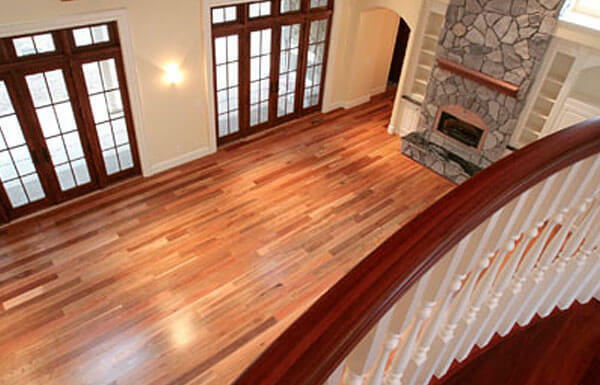 Our refinishing experts will have your old hardwood flooring and stairs looking like new again at an affordable price. Sunshine Hardwood Flooring restores heavily worn or outdated wood floors and stairs by repairing, sanding, staining, and finishing them to the look you desire. Sometimes wood floors can get cracked, or stained from pets or water. The first step in restoration is to replace any damaged boards or repair them with filler before the sanding process begins. Using state-of-the-art equipment for virtually dust-free sanding, we remove the layers of old finish to get down to bare wood. Buffing the bare floor will even out the surface and remove all roughness to prepare for the stain finish. Next, we can put down a few sample stain colors of your choice to help you decide what look you'd like for your newly restored wood floors. We only use high-quality DuraSeal stains by Minwax, which has been trusted to protect wood flooring for over 80 years. Once the entire area has been stained it is time to apply the three coats of finish. By buffing in between finish coats, we ensure the floor stays smooth with a level finish. There are many coating options to choose from, including no-odor, environmentally friendly water-based finishes; longer-lasting, but slow-drying oil-based finishes; and Glitsa, which dries in about 5 hours but requires much more time to allow the fumes to fully dissipate. We'll make recommendations on which finish to use based upon your budget, priorities, and level of foot traffic your floors receive. Once we are done, we provide guidance on how to maintain your floors so they look beautiful for many years to come. Sunshine Hardwood Flooring offers hardwood flooring restoration services in Boise, Idaho, for homeowners, businesses, real estate companies, and home remodelers. Our 1-year workmanship warranty ensures that you will get high-quality refinished wood floors that meet or exceed your expectations. We offer free on-site consultations and estimates for wood floor refinishing services in Boise, Meridian, Eagle, and surrounding areas. During a consultation, we will assess your floors and stairs, measure the job, discuss your restoration goals and budget, and come up with a plan that works for you. Call Sunshine Hardwood Flooring today to schedule your consultation.